For over 30 years The Hat People has provided hats guaranteed to be the best in quality, detail, and craftsmanship. 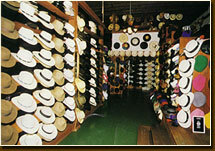 "Locally World Famous," The Hat People is renowned for its selection and quality, and ship their hats all over the world! From high style wear to active sports wear, the diverse collection of headwear will suite any occasion. Come visit our charming shop in Historic Old Town Spring, Texas.